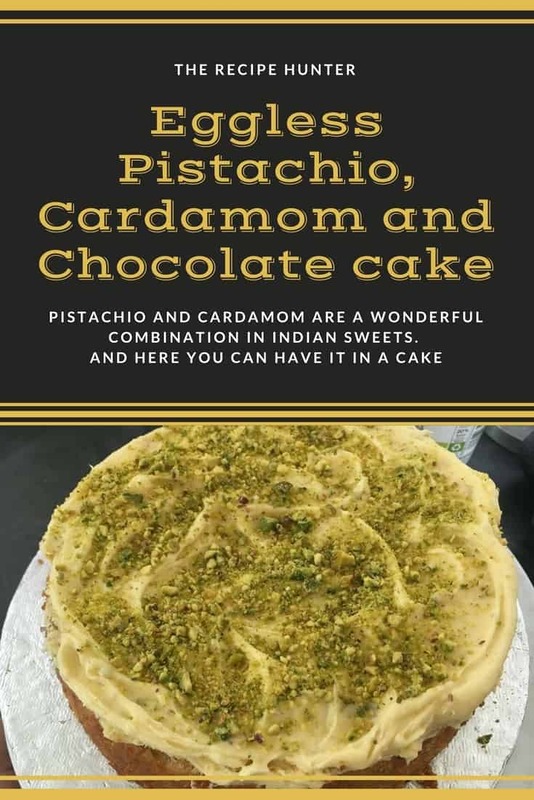 Pistachio and cardamom are a wonderful combination in Indian sweets and here you have it in a cake!! In a bowl, cream the margarine and sugar, until light and fluffy. Add the applesauce and whisk till nicely combined. Add the self-raising flour, cardamom powder, baking powder and milk, whisk until everything is combined. Fold in the nuts and the chocolate chips. Pour into a lightly greased cake tin. Pop into a pre-heated oven and bake at 180 degrees for 20 – 25 minutes, or until the cake tester comes out clean. Allow the cake to cool for 15 minutes in the pan, before turning out onto a cooling rack and allowing to cool completely. 150g white chocolate, I used Cadbury Dream chocolate. Gently melt the white chocolate in a bowl over simmering water on the stove. While the chocolate is melting, cream the margarine until light and fluffy. Fold in the melted chocolate and mix till everything is well combined. Generously ice the top of the cake, sprinkle and grate the nuts over the top. Pop into the fridge for 30 minutes so that the icing can firm up a little before serving.